Cast: Kim Young Kwang, Jung So Min, Ha Suk Jin and Yoon Joo Hee. 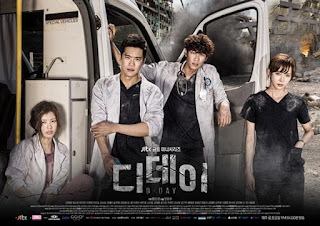 This drama is about a natural disaster striking Seoul, and we follow a group of doctors and firefighters as they are trying to help and save the citizens, but also about the social and political consequences arising due to the situation. Lee Hae Sung (Kim Young Kwang) is an empathetic doctor doing his best for all his patients, but also a very competent one. After he loses his father in a car accident and his mother got into a coma, he accepts the ill treatment from his chief so his mother can stay inside the hospital where he works. The chief of the hospital, Mirae University Hospital, is only concerned about the reputation and economic of the hospital, which is where the two opinions collide. Jung Ddol Mi (Jung So Min) is 3rd year resident at a university hospital in Busan, but when there was talk about moving a patient to Seoul she offered to go, on her own: wanting to meet her idol Han Woo Jin (Ha Suk Jin), who happens to be a college friend of Hae Sungs, but also someone who agrees with the chief of the hospital. Hmm, I am not sure I am doing this drama justice with that type of summary, but it is incredibly hard not to spoil anything. I personally am a huge fan of disaster stories; both movies and TV shows. Therefore, I was very excited about this when I found out about it. I also like the idea of it being about doctors and firefighters, as we usually don’t have that view – or at least I haven’t seen any with it – that shows us about their struggles and situations. Kim Young Kwang is a very talented and handsome actor, whom I liked for quite a while now, ever since White Christmas I think, so seeing him in this character was amazing. I was afraid they would make him like this perfect guy/hero who saves the day, so I was more than happy when they showed his human side every so often. Jung So Min is one of those actresses that I can’t stand, not because she’s annoying or ugly, but because I didn’t understand why she would be acting as she is horrible at it. Made me confused about the casting. However, to be fair, the dramas she had acted in where quite bad: that said this actually shows a bit of improvement. Not that she is a favorite actress now, but she is decent and tolerable here. The only thing that I didn’t enjoy in this drama was amount of politics involved and the feud between the two male actors, and the chief. Then again, it started with a bang; they can’t continue all the way like that. So do I recommend this drama? Hell yes! I am not sure where to start with this drama as this is an amazing drama. Probably one of the best dramas of 2015 if not the best. I could talk about how great this drama is for a long period of time, but I will try to make this review as short as I can. I really enjoyed watching this drama i'm shocked it's not popular, everything about it was fun, exciting and damn it could keep you glued to your laptop. There are some things this show has done very well, and that has largely been in the cinematography and the cast. I really appreciated the way everyone made their roles as believable as possible, and I especially loved the chemistry that came from the different characters. I really loved the relationship between the two main leads, but I wish we had seen more romance between them. In addition, like everyone else who watched this drama, I agree with the overdone enmity between the director and our reckless and skillful doctor. They could have turned it down a bit, I mean it goes on for 20 episodes! Everything else was good. Double recommended!